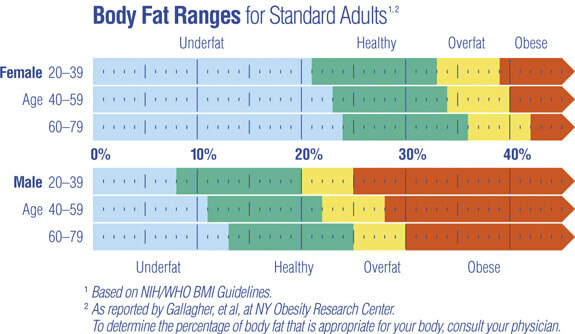 Body fat is an essential number to know when evaluating your health and is one of the most important factors in influencing your health risk. It is important to keep your body fat in a healthy range, where both too much and too little fat can be detrimental to health; Some fat is essential in keeping your body temperature and energy levels optimal, protecting vital organs and supporting disease resistance. Too much body fat significantly increases your disease risk. There are a number of methods to measure body fat, with the most accurate requiring a health professional to assess your overall body composition in a lab environment. DEXA scans are the gold standard for body composition monitoring, with skin-fold measurements and other methods useful if DEXA scanning is not accessible. However, body composition monitors are available for low-cost home monitoring. BMI (Body Mass Index) is not a good measure to use when assessing your individual body composition, primarily as it does not take into account that muscle weighs more than fat - which can skew your score to incorrectly categorising you as "overweight" or "obese".